Pack of 5 - Johnson and Johnson reach dentotape waxed ribbon dental floss : Designed especially for cleaning wide spaces between teeth. It is extra wide cleaning surface. ADA Accepted - American Dental Association. The floss dentists use most. Flossing has been clinically proven to clean away the plaque from between teeth that brushing and rinsing cant remove. It is extra wide cleaning surface. ADA Accepted - American Dental Association. 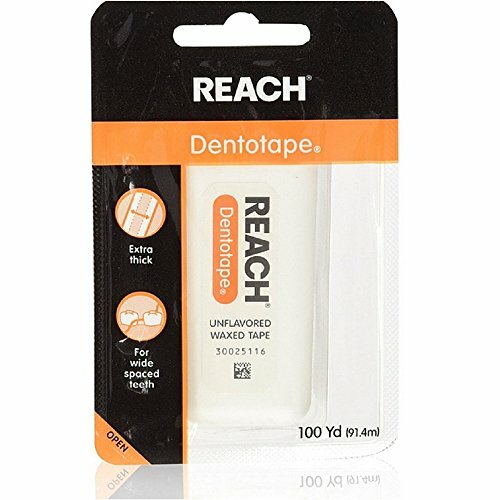 Dentotape waxed ribbon floss gives you extra cleaning surface for effective plaque removal. Flossing has been clinically proven to clean away the plaque from between teeth that brushing and rinsing cant remove. If you have any questions about this product by Reach, contact us by completing and submitting the form below. If you are looking for a specif part number, please include it with your message.